It's finally finished and back from the printer, our first book, BLOOMING POSSIBILITIES. The idea for the book started one day when Janice and I went shopping and found a cute little flower. From there, it blossomed into 3 fabulous fabric flower designs. Those 3 flowers inspired the 9 projects in the book. First the specifics. The book has 12 patterns and projects in all. The book is 32 pages with color photographs of every project. Complete instructions and full size templates are also included. The best part is, the flowers are only the beginning. Once you start making them, the POSSIBILITIES are endless. First the pictures, then the giveaways. These are the three different flowers. Fun and easy to make. Try mixing the flowers together to create all different looks. Then we came up with bags to put the flowers on. There is a clutch bag and a sling bag for the Ladies. The girls get a purse and a smaller version sling bag. The sling bags are reversible too. After purses and bags, it was easy to see these flowers could go everwhere. How about hair clips, lapel pins, t-shirts, jackets, even flip flops. We didn't stop there. We thought, hey we can put these flowers on the wall. And last, but not least, we topped it off with a hat. There are even two different brim sizes. Now, what you have been waiting for. THE GIVEAWAY. Rules for give away - 5 ways to get their name entered. 1. Leave a comment on which project you will make first - or maybe which is your favorite. Not sure, sorry, you gotta pick at least one. 2. Tell us which flower, first, second or third, is your favorite. Their official names are the "LIZZY", the "SADIE", and the "ELANOR". Check our website to find out which is which. http://www.abbeylanequilts.com/. 3. Mention our give-away on your blog. Leave a link so we can visit and yes, Janice reads every one. 4. Become a follower on the blog. We really want to get 300 followers. If you are already a follower, be sure to let us know. 5. Face book - become a friend. If you are already a friend, then tell everybody about the book. That's it. Now, what are we GIVING AWAY. We will start out with a hat. The cute one made with the Amy Butler red and off white Polka Dot. You get a book too, to make something to go with the hat. We are giving away books, three to be exact. 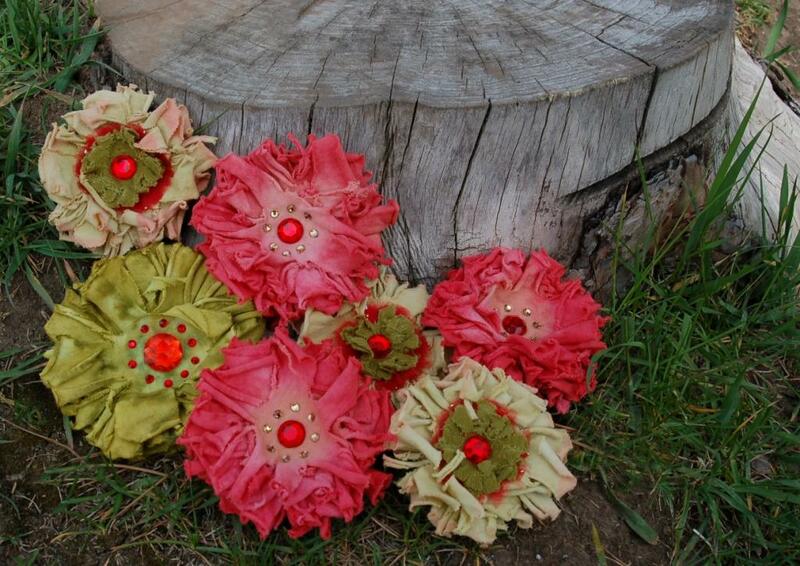 And last, but not least, Marcea will be making five special "LIZZY" flowers for five lucky ladies. So, GOOD LUCK. We will randomly pick the winners a week from Tuesday. Oh yeah, Janice went to everyone's blogs during the last giveaway. It is so fun to see what y'all are doing. That's it. Hope you all are as excited as we are. Can't wait to hear what you think. They all look so cute but I really love the girls purse bag, the gathered one with the band. The Eleanor flower is my favorite! Oh my!!! !, I'd love to by surrpunded by flowers, I love flowers in the wall and the ones you use for the bag!!! I love the flip flops! So that is my favorite that you are showing BUT the sling bag is a really, really close second. If I won the book it's the bag I would make first to go along with the flip-flops!! For the favorite flower? I pick the "Lizzy" hands-down. I LOVE.. L.O.V.E. the button! The possibilities to show off antique buttons is endless!!! I am already a follower. Now, do I have to post this as three different posts? Or will this one post work for three entries? I think the Sadie is my favorite flower. As far as a favorite project, I like the "Purse" the best. It looks so comfy. My favorite project is the hat...too cute! My favorite flower is Lizzy. And I just became a follower. I'd love to win...thanks for the opportunity!! I love the flowers on the T-shirt! Thanks for the chance. Easy! the clutch bag is too cute! I think the wall hanging is my favorite! Really cute. Oh my gosh, those projects are AWESOME! I love everything. And even though I am a bagaholic, I simply adore those flips, so that is what I'd make first (I live in flips during the summer!) 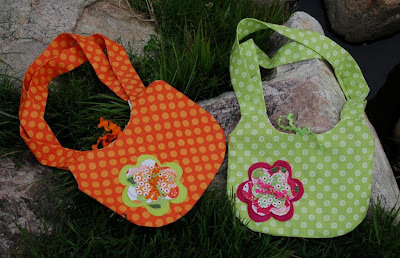 Then I'd make one of the bags, then the flower art, then another bag...LOL!!! The book looks awesome and I would LOVE to win one! Thanks for the opportunity! Although I really like all three flowers, I do love the Elanor flower best! I would love to make the wall-hangings!!! 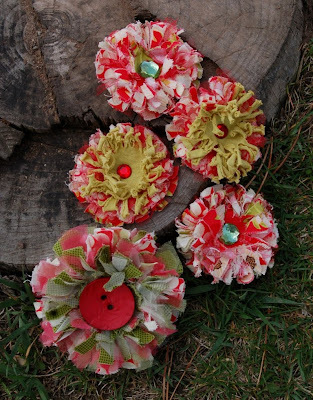 I love, love, love fabric flowers. 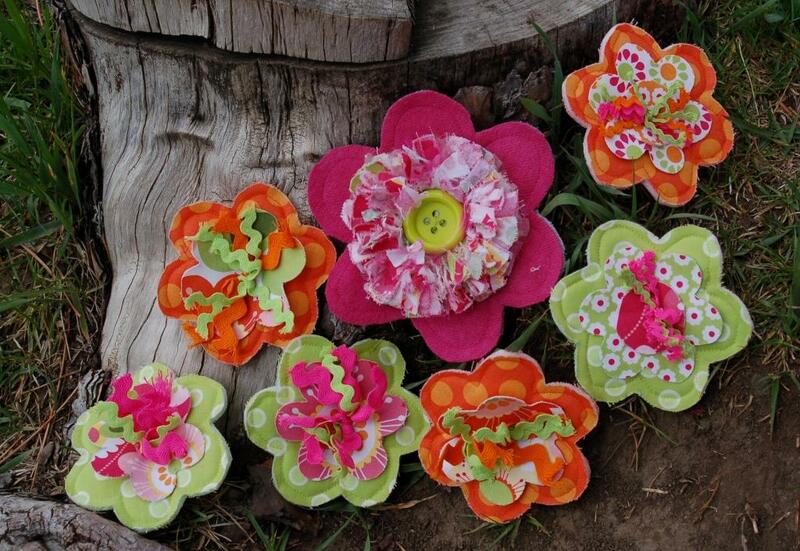 Have several books on fabric flowers too. Yours are very unusual, with a natural flare! My first project would most likely be a flower I could add to my hat, but I'd also very much like to make a flower wallhanging using your design too! Hi I really love the elanor flower that is definitely my favourite. I think I would like to make that 1st handbag with wrist strap I could do with a new handbag. Hi I've just become a follower. What a floral riot! I would make the flowery flip flops first. Well, I'm a Lizzy so I ought to choose that flower as my favourite but actually my favourite is Eleanor! And of course I'll follow your blog here, for another entry in your wonderful giveaway. Congratulations on the book, your flowers and all the handbags and gladrags are really glorious. The flower projects are totally cool!!! All of the projects are fantastic, and only because you're making me pick one, I would choose to make the hat first. The flower that I most like is "Lizzy". And I love following you on FaceBook, too! I would start with making the flowers. 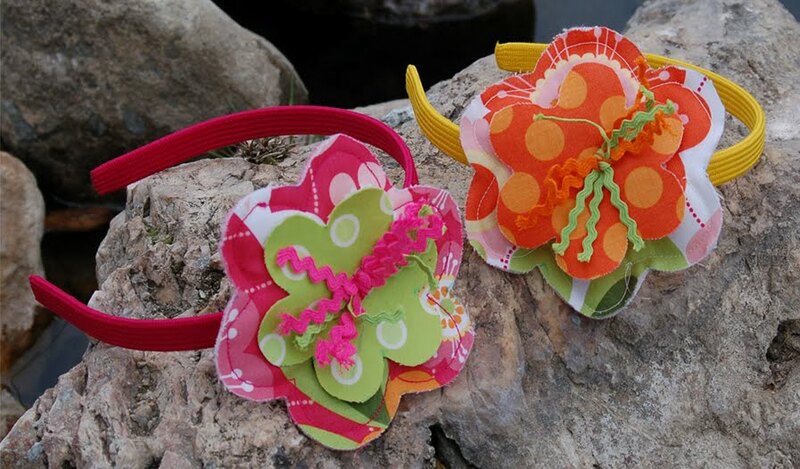 I have a grand daughter who loves flower hair clips and headbands. I'm a friend on Facebook!! I am definitely going to make a hat. First thing! The Eleanor flower is my favourite. Definitely would make a hat - nothing like making a hat with your own fabric! Then I would make everything else! LOL! They all are so much fun! "Eleanor" will be the one. My favorite flower (entry #2) is the Elanor although it was almost a tie between it and the Lizzie! I love following your blog! My favorite flower is the Lizzy, and my favorite project is the hat! 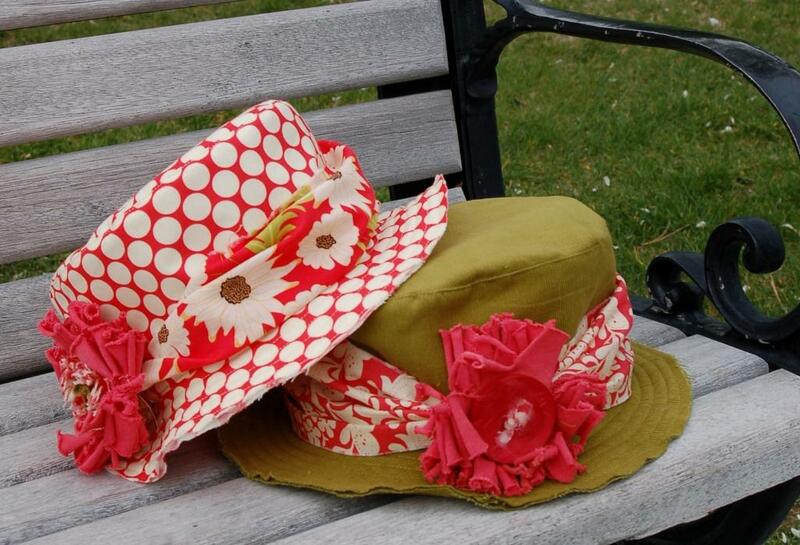 I would totally put a Lizzy flower on my favorite bucket hat! I choose the Eleanor flower as my fave! That will go well on purses and such! Wow! I am in love with flowers AND purses. The first purse I would make would be the clutch purse and my favorite flower is the Elanor. I have just signed up to follow your blog, and although I do not have a blog, I have aput your link on my facebook page, and I am on my way to being your Facebook friend! Awesome! Awesome! Awesome! I would try a headband first! I like the eleanor flower best! I would do the slippers as my first project for my mother and sister! Ohhh Bags, definately bags for my first project. I found you on facebook too. I want to begin with a hat. Ask my friends - I wear hats all the time. My favorite flower is the Eleanor. It's gorgeous!!! Definitely the hat - so adorable and with the cute flower I can wear a hat all the time! I'm already a follower - yeah! I already "like" Abbey Lane Quilts on Facebook! I am all about the Eleanor flower!! I would have to do the flip flops first, I'm in them all the time and I just got my nails done so I can match them up! Wow!!! My favortie flower, if I must pick is the Eleanor followed close behind by the Lizzy. 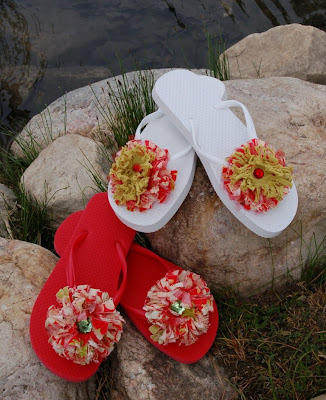 My first project (when I win the book) will be the flipflops for my granddaughters - they will love them. Then I will turn attention to making something for me - purses will do. I am a follower - too old for Facebook and don't blog. It's hard to pick just one, but I'd have to say the wall art is my favorite project. So inspiring! Again, hard to choose a favorite but I'd have to go with Lizzie. I'd start with Elanor, but would have to try them all eventually! Love your work. The first thing I would make is the bag on the cover. I LOVE IT! I'd pick the Lizzy flower. I like your lovley gathered purse, the one with the band. all your flowers are lovely. but my flowe is sadie. These look great! I love the Elanor flower the best. As for a project to start with it's hard to choose! I think the second bag, the headband for my daughter and the flipflop flower project as I always have multiple projects going at one time. The projects from your new book look so fun! I think I would make the headband first for my daughter. Thanks for a chance at your giveaway! My favorite flower is the Eleanor flower! The book looks great. I think the first pattern I would make is that clutch. I love the way you designed the ruffle at the top. My favorite flower is the lizzy. Beautiful, but kind of understated. I became a follower. I'm looking forward to reading through older posts. I like the sling bag! I like the Lizzie flower! Hello here I am!!!!! I love the Flip Flops!!!!! I love the SADIE flower!!!! I want to make the wallflower ;) for my little girls' room. I like the eleanor flower! I'm now a blog follower! I think the wall hanging flowers are my favorite! THe lizzie flower is my favorite! I follow your blog through google reader. My favorite flower is the Sadie!!! And now I am a fan of abbey lane quilt too! I love the "Sadie" flower! 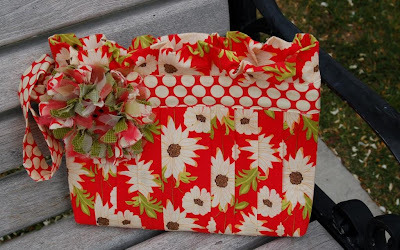 Today was the first time I have seen your blog and website....gonna share it with my fellow quilters!! I love the hat....I think a hat and matching purse would make a great gift for a friend! What gorgeous flowers and the book looks spectacular. I hope I'm not too late to enter my name for the draw. I would love to make the darling purse and I'd use the LIZZY flower on it. I just love how fuzzy/ruffly the Lizzy posie is and it is my favorite, though it is tough to pick just one! I've become a follower of your blog and am looking forward following your posts, designs and creative ideas. I've posted on facebook page to let my friends know of your wonderful website! most certainly first I would dress up my drab sunhat for our 30th anniversary Hawaii trip... then some for flip-flops... then oh my possibilities are endless. To be more specific on the purse, I should have stated that I just love the clutch purse with the ruffles at the top. 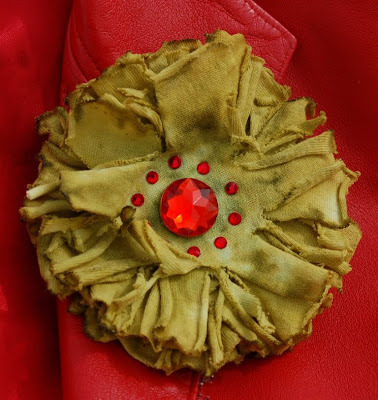 What a gorgeous, feminine clutch and the Lizzy flower would set it off perfectly. I want to make that clutch bag!!! The Lizzy flower is my favorite! Sure, I'll join you on fb. Up to the minute info, right? I am following your blog. 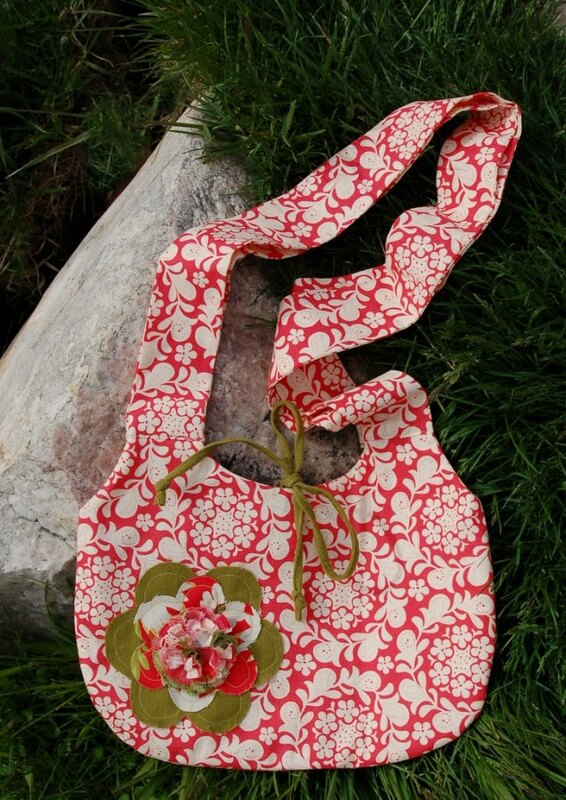 Would like to make the sling bag first, with the Sadie flower. Cute. I love all of the flowers, but I suppose my favorite would have to be the "Lizzy". It's also hard to pick a first project because they are all so cute, but I guess it would have to be the purse with the gathering and band at the top...followed quickly by an embellished tee and one of those great hats! I also followed your blog today (yay 250th follower! )and friend requested you on Face Book. Lastly, thanks for such a great giveaway opportunity. I'm so glad I found you blog and shop! 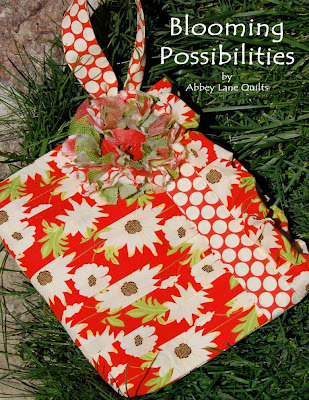 Just made a friend request on Facebook from Abbey Lane Quilts! And...thanks for the giveaway! Would really like that book. They are all adorable but I really like the wall flowers. Those would be great many places. So sorry for the separate posts but I finally figured out how to send a friend request on Facebook. I'm looking forward to reading your updates on facebook as well as your blog. Oh My. I've got to get my hands on that tred and white polka dot hat!!! So adorable :o)! I don't have a blog yet so I tweeted about "Abby LAne Quilts". Everything is so beautiful!! Hi! Love all your new projects. The "Lizzy" flower is my favorite. I think I would do the wall hanging first and the flip flops next. Can hardly wait for your book to come out. Thank you both. the ELANOR is my favorite, starting to transform my guest bedroom into a sewing/craft room and these would be adorable! Love the sling bags too! I luvvvvvv the Lizzy flower the best and am excited to get the book so I can make myself the wall art, it's super cute!!! and I'm following your blog and added youi as a facebook friend!!! And soon we'll be facebook friends!!! Hmmmmmmmmm.....this is hard, but I like the hats. I like the Sadie flower. I posted the giveaway on my blog....go check it out. I signed up to follow your blog! 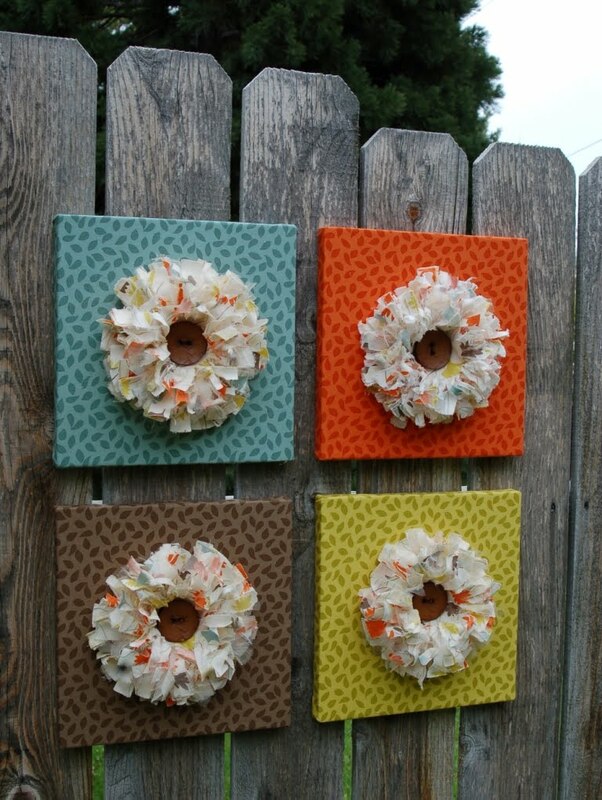 The wall flowers, I have a perfect spot in my new studio that can use the pop of color and fabric. And I love the Eleanor flower. And you'll see a new friend request from me ion Facebook. Thanks for all the chances. 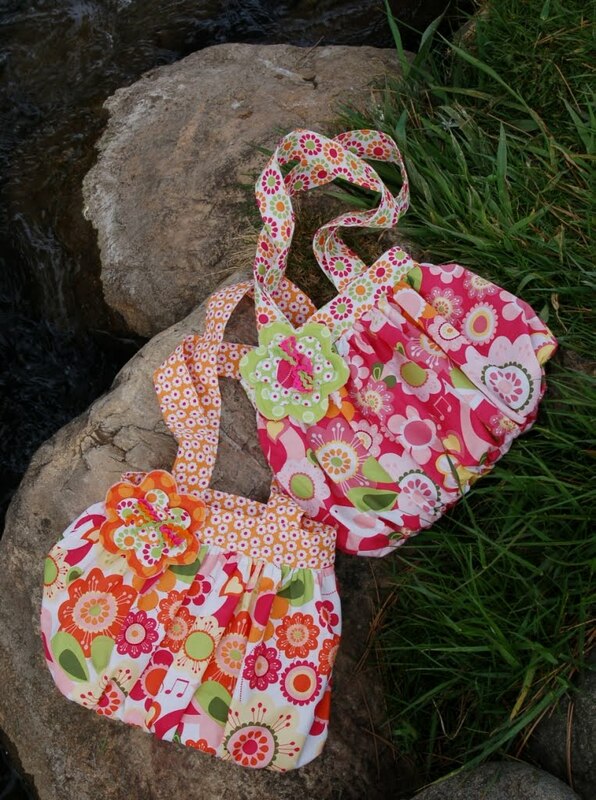 I would make the girls sling bag and a headband to match and flip flops and then a clutch for MEEEE!